You're just a clump of cells no different than a wad of phlegm expectorated on the street, right? I know I'm responding to an old post, but I can't not say this. 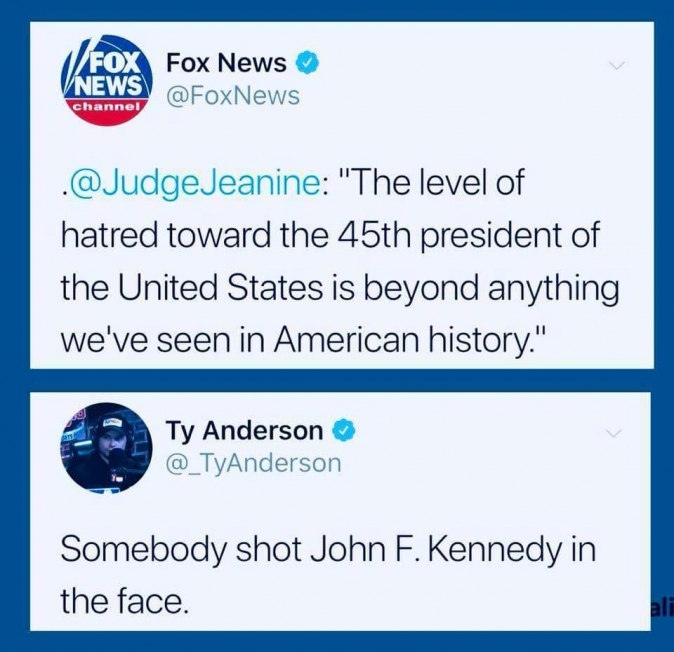 Ya but... did the person HATE Kennedy? How can we know? We don't even know who done it. It was probably either the deep state or one of the guys whose girlfriends Kennedy boned. It's a pretty good bet that Judge whatshername was referring specifically to how he's treated publicly. So media coverage, outspoken public statements by celebrities, and generally anything that's broadcast, read, etc. The phrase "most hated" doesn't mean "how much does one person hate", but "how many people hate". Kennedy was generally very highly regarded by most people. Some have said he was the most loved president in the 20th century. So not really a great analogy, or response. It's a pretty good bet that Judge whatshername was referring specifically to how he's treated publicly. You have a different definition of "most hated"? Please share with the group then. You have a different definition of "most hated"? Wrong group of words, Dorothy. It's an even better chance that she was just speaking in half-assed hyperbole and didn't stop for even a half second to consider what she was saying because she was more interested in pandering to a partisan audience with a permanent martyr complex than any sort of accuracy. It's funny how many times you use phrases like "pretty good bet", "obviously", "it's just so obvious", etc. We know when you don't know what you are talking about. It's the same way we can tell when Turmp lies, we can tell from his use of phrases like "trust me" or "believe me"
Gbaji is like Newt Gingrich. Both season their comments liberally with authoritative sounding words to cover for a lack of content and plausibility of their scenarios. You can tell that the more ridiculous or bullshitty a comment is, the more words get peppered in to try to mask the smell. Another day, another one of those Hitler loving socialist liberals who is strangely confused about which political party best represents and accepts his viewpoints. Pressed to clarify his Hitler comment, he questioned its validity until a reporter cited the date and time of the recording. West then said that he’d been taken out of context. He said that he believes all men are created equal, but not all ideologies are equal. Specifically, he said, he finds fault with Islam and Judaism. "We just don't condemn them enough to actually do anything about it." Heh, that's like the Nazi who ran here in Illinois and the state GOP assured everyone that they were just disgusted by it... but not enough to take any action at all to oppose him, run someone else against him or otherwise keep him off the GOP ballot. A Democratic candidate for Congress in a conservative north Georgia district who was convicted this week of drunken driving challenged the officers who stopped him to a fight and repeatedly insulted the county he was running to represent. Steven Lamar Foster boasted about how many times he’s been arrested and called the officers who arrested him “Barneys” in dash-cam footage of the September arrest obtained by The Dalton Daily Citizen-News. Barneys? I like it. That's one I hadn't heard, but it's so obvious I feel like I should have. But which Barney was he referring to? Don't look at me no offense, I was just answering the question the previous poster Debolic had asked. No love for Barney Gumble? Barney Stinson? Barney Calhoun, the Black Mesa security guard? Stinson wouldn't really be an insulting generalization. Everything sounds insulting if you're drunk enough. It's a state house seat that, at least from a very brief examination, appears to be pretty well locked for the Dem candidate (there's only one Dem in the race, and he's the incumbent, no one from the GOP even ran for the seat last time around, and I don't feel like doing more research than that). Not too surprising that the state GOP organization would spend somewhere near zero time or effort on the seat, nor who might decide to toss their hat into the ring for it.